Should You Drink that Starbucks? Caffeine has many positive and negative effects and one might wonder if he or she should consume it to have a productive day. College students consume large amounts of caffeine, some just because they need a morning wake-up, others because they need to stay awake. Should caffeine be consumed to assist in studying for tomorrow’s exam or does it do more harm than good? Hopefully this article will clear up your confusion, giving you a nice dose of information on the advantages that caffeine can have while studying. To get everyone up to date on what caffeine is, here is a little background. Caffeine is naturally found in many plants such as coffee beans, tea leaves, and cocoa. It can also be found in a white, crystalline form and is commonly placed in drinks such as soda or energy drinks. Caffeine has been found to reduce fatigue, increase focus, and to improve coordination (Caffeine). It also has psycho-stimulant effects on the central nervous system including promotion of wakefulness, increase of arousal and decrease in fatigue (Botton). Caffeine has been proven to have positive effects on increasing alertness, cognition, and on memory processing efficiency (Lorist). This is great to know, but how is caffeine able to do this and what evidence is there available to prove that caffeine really does have these effects? One study tested the effects of doses of caffeine on memory recognition. This study used mice to help test their theory. Scopolamine was given to the mice to cause memory impairment (Botton). It has anticholinergeric properties, blocking acetylcholine receptors in the nervous system so information cannot be transferred to the brain to be processed (Anticholinergic). In one trial, the mice were asked to recognize an object. The mice were treated with the scopolamine and then with caffeine or saline. It was found that the mice treated with the caffeine did not spend as much time on the object, indicating that they recognized it from before and therefore did not need to investigate it. (Botton, Fig 1). This was found true for short term trials, but not for long term trials. It can be concluded from this research that caffeine helps promote memory recognition by enhancing cortical cholinergic transmission by increasing the release of acetylcholine in the brain (Botton). Overall it can be concluded from this study that taking caffeine inhibits the effects of scopolamine thus increasing memory recognition in short term situations. Another study also confirmed that caffeine also helps improve memory recognition. The study looked at the presence of brain derived neurotropic factor (BDNF), which is present in the memory and learning complex. This study was conducted with laboratory mice that were treated with caffeine and saline, and then tested on object recognition. The mice were treated with a dose of caffeine that equaled about two to three cups of coffee. In figure two it is shown the caffeine treated mice have a decrease in the time spent assessing an object after a certain amount of time after being given the caffeine dose. After the training session, the mice spent less time looking at the object, meaning that the mice could recognize the object faster. This is particularly true for the mice in chart C. The mice spent drastically less time assessing the object after a 24 hour waiting period between training and test session than with just 15 minutes between training and test session (Costa). It can be concluded that object recognition is better if given a longer waiting time period while under the influence of caffeine. Further analysis of this study looked at the density of brain derived neurotrophic factor, TkRB, which is it’s receptor and also at phospho-CREB (Costa). Phospho-CREB is a phosphorylated form of CREB, which is a transcription factor important in memory recall and recognition (Phospho-CREB (Ser133) Antibody #9191). As seen in figure three below, brain derived neurotrophic factor and its receptor, TkRB, were found in increased density in caffeine treated mice than in non-caffeine treated mice. Phospho-CREB density was found to be about equal in both situations as can be seen in figure two (Costa). This proves to show that caffeine increased brain activity, especially in the memory department, thus helping with memory recognition and memory recall. From an analysis of a study that delves further into caffeine’s molecular interactions, it can be seen that caffeine affects certain receptors in the striatal tissue of the brain. At different levels of caffeine, different receptors are activated, resulting in the different effects. At lower levels of caffeine, 10 milligrams per kilogram, the levels that have been shown to have positive effects on memory recognition and recall, the receptor A2AR is responsible for stiatal gene expression (Yu). Thus concluding that A2AR is the target receptor for caffeine. Below, it can be seen how the receptor and caffeine bind to each other. Higher levels of caffeine induce a much larger gene population, with many different genes, becomes active. This supports the theory that certain effects of caffeine are only present in lower doses and different effects are only present at higher doses. Since we know that drinking caffeine can significantly benefit your late night study habits, what sources of caffeine and how much should you be consuming to achieve the highest possible effects? Does the Red Bull Energy Drink with 80 mg of caffeine per 8.4 oz, the Monster with 160 mg per 16 oz, a 5 Hour Energy with 138 mg of caffeine in every 2 oz, or a cup of coffee with about 108 mg for every 8 oz keep you awake and focused better (Caffeine Content of Drinks)? In the first study discussed at the beginning of this article, caffeine was given to the mice in about a three cup dose (Botton). It was shown to increase cognitive performance in the mice and to also improve memory recognition with this three cup of coffee dose of caffeine (Botton). Caffeine has been shown to block adenosine receptors with just one cup of coffee as well (Lorist). This has also been shown to be the main mode of action for caffeine (Chawla). Adenosine receptors’ function is to block transmission of neural signals, so caffeine prevents this from happening allowing information to be processed and transferred around the brain. It has been shown that lower doses of caffeine have positive effects on the body, while doses higher than 500 milligrams can have negative effects on the body. Higher doses of caffeine have been observed to cause anxiety and nervousness (Lorist). Low to moderate doses of caffeine, levels of 50 to 300 milligrams per kilogram, have been shown to be the most beneficial effects including increased alertness, energy and the improved ability to concentrate (Chawla). A research study assessed the effects of Red Bull on psychomotor performance which includes memory, concentration, and reaction time. In the test group testing the effects of Red Bull Energy Drink, the subjects were given a normal 250 milliliter can of Red Bull Energy Drink, which contains 80 milligrams of caffeine. To test memory recall the study had the participants look at a list of numbers for one minute and then recall as many numbers that they could after the list was taken out of sight. 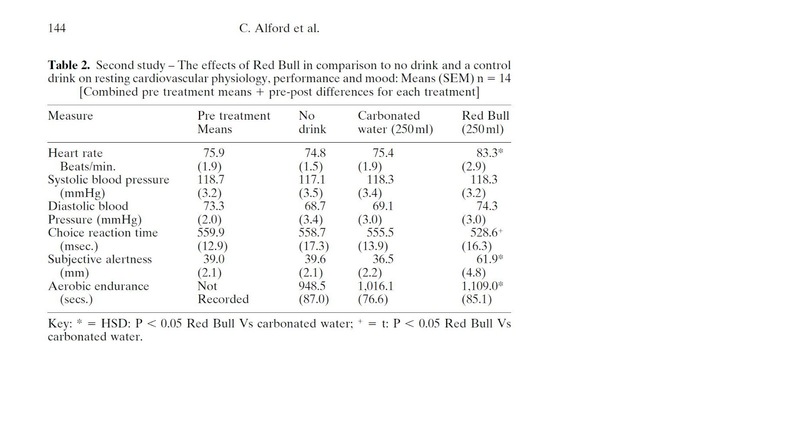 It was found that the Red Bull Energy Drink enhanced choice reaction time, derived from the number test, and increased alertness. From figure four it can be seen that the amount of reaction time was decreased when the subject had drunk the Red Bull Energy Drink. It can also be seen in figure four that alertness is almost doubled when compared to the control subjects (Alford). It can be concluded that one serving of Red Bull Energy Drink will help increase a person’s ability to remain alert and to also increase memory recall. This information thus concludes that Red Bull Energy Drink can give an appropriate amount of caffeine if an energy boost is needed. Finally, when should you be drinking that cup of coffee to achieve the most positive impact? In conclusion it can be assumed that alertness and memory improvement from caffeine occur when the amount of caffeine and the amount of time that it is ingested in is taken into consideration. Dosage wise, it can be concluded overall that the best effects from caffeine occur at lower to mid level of ingestion. So if you’re drinking caffeine for alertness purposes, it is best to consume caffeine in low to moderate levels throughout the whole time period for the best performance results. Time wise, it is not effective to consume a large portion of caffeine and then expect it to last for eight hours because it has a half life of three to five hours (Lorist). Caffeine is most effective if taken in smaller doses consistently over a larger time span. Research shows that the highest levels of caffeine in the blood occur 30 to 60 minutes after consumption. Final effects do not wear off until five hours after consumption, though after peak occurs, the effects of the caffeine on the body starts to decrease (Lorist). It has also been shown that caffeine withdrawal decreases alertness. As a student staying up late to study and trying to avoid the wave of sleep that may come, it is important to keep caffeine levels up in the body to maintain alertness. One advantage that college students may have is that they are usually run down some, from either sleep deprivation or from being on the go all the time. One study concluded that caffeine is most effective if taken when the stimulus condition was not at its peak and even in a slightly degraded state. In the study it was shown that people with fatigue showed greater increase in behavior efficiency. The test subjects that were not under fatigue did not show as great as an increase in behavior efficiency. From this research study it can be understood that caffeine counteracts the effects of tiredness (Lorist). For a sleep deprived college student who needs a boost of energy to allow them to stay up and study for a test, it can be concluded that taking caffeine in consistent moderate doses will allow to you stay alert. It can also increase your ability to retain the information that is being crammed into the brain. An extra bonus! Drink that cup of coffee and then have another, or drink that energy drink over a longer amount of time, sit down at your desk and prepare yourself for that test. Alford, C., H. Cox, and R. Wescott. 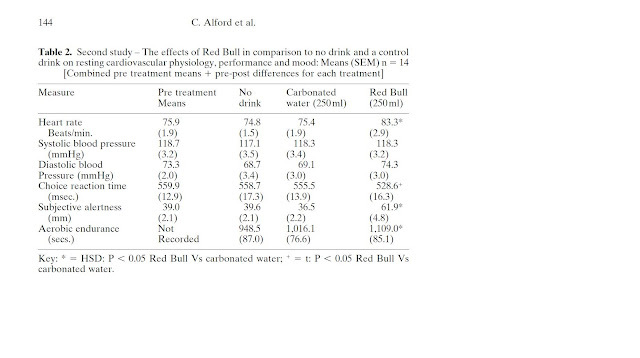 "The effects of Red Bull Energy Drink on human performance and mood" Amino Acids Vol. 21. (2001): 139–150. 11 03 2012 <http://www.springerlink.com.proxy2.library.illinois.edu/content/xxdbgvjy9ke72wbl/fulltext.pdf>. "Anticholinergic." Wikipedia. Wikimedia Foundation, 06 Mar. 2012. Web. 08 Mar. 2012. <http://en.wikipedia.org/wiki/Anticholinergic>. Botton, Paulo Henrique, Marcelo Costa, Ana Paula Ardais, Sabrina Mioranzza, Diogo Souza, da Rocha Joao Batista Teixeira, and Porciuncula Lisiane O. 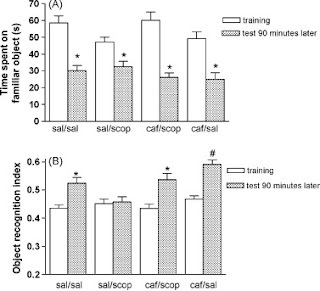 "Caffeine prevents disruption of memory consolidation in the inhibitory avoidance and novel object recognition tasks by scopolamine in adult mice" Behavioural Brain Research Vol. 214. (2010): 254–259. 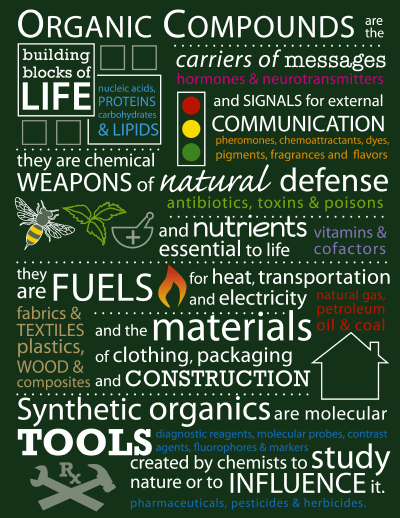 25 02 2012 <http://www.sciencedirect.com/science/article/pii/S0166432810004080>. "Caffeine." Wikipedia. Wikimedia Foundation, 11 Mar. 2012. Web. 14 Mar. 2012. <http://en.wikipedia.org/wiki/Caffeine>. "Caffeine Content of Drinks." Energy Fiend: The Caffeine Fix. Energy Fiend, 2012. Web. 01 Mar. 2012. <http://www.energyfiend.com/the-caffeine-database>. Chawla, Jasvinder, and Amer Suleman. "Neurologic Effects of Caffeine." Medscape Reference: Drugs, Diseases, and Procedures. WebMD, 01 Nov. 2011. Web. 10 Mar. 2012. <http://emedicine.medscape.com/article/1182710-overview>. Costa, Marcelo S., Paulo H. Botton, Sabrina Mioranzza, Ana Paula Ardais, Julia D. Moreira, Souza Diogo O., and Porciuncula Lisiane O. 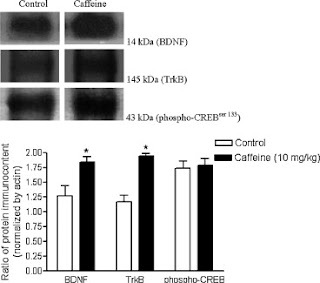 "Caffeine improves adult mice performance in the object recognition task and increases BDNF and TrkB independent on phospho-CREB immunocontent in the hippocampus" Neurochemistry International Vol. 53. (2008): 89–94. 25 02 2012 <http://www.sciencedirect.com/science/journal/01970186/53/3>. Lorist, Monicque M. , and Mattie Tops. "Caffeine, fatigue, and cognition" Brain and Cognition Vol. 53. (2003): 82–94. 25 02 2012 <http://www.sciencedirect.com/science/article/pii/S0278262603002069>. "Phospho-CREB (Ser133) Antibody #9191." 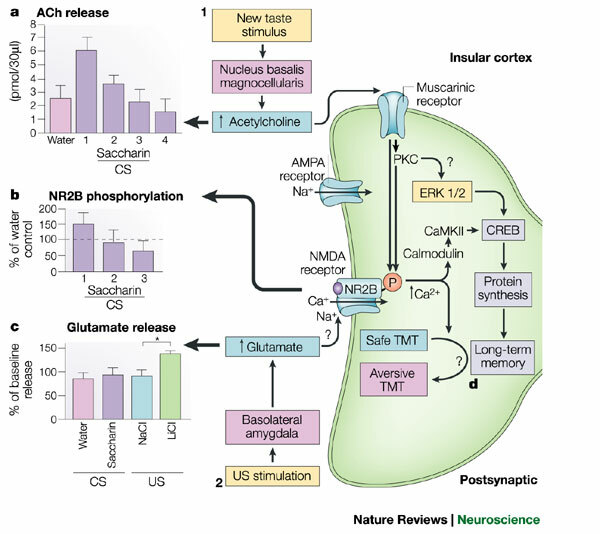 Product Pathways - Neuroscience. Cell Signaling Technology, Inc, 2012. Web. 08 Mar. 2012. <http://www.cellsignal.com/products/9191.html>. "Scopolamine." Wikipedia. Wikimedia Foundation, 12 Mar. 2012. Web. 14 Mar. 2012. <http://en.wikipedia.org/wiki/Scopolamine>. Yu, Liqun, Joana E. Coelho, Xiaoling Zhang, Yutao Fu, Abigail Tillman, Ulas Karaoz, Bertil B. Fredholm, Zhiping Weng, and Jiang-Fan Chen. "Uncovering Multiple Molecular Targets for Caffeine Using a Drug Target Validation Strategy Combining A2A Receptor Knockout Mice with Microarray Profiling." Physiol Genomics Vol. 37. (2009): 199-210. Web. 1 Apr. 2012. <http://www.ncbi.nlm.nih.gov/pmc/articles/PMC2685498/>. Mara, you really covered all the aspects of caffeine! Many of the questions you asked I even wondered myself. I have never been a big fan of caffeine until this year and I have really noticed the effects. I found it very interesting that tests have shown consuming caffeine over a longer period of time rather than drinking it all at once has a better effect on studying. I think that this topic is very relevant considering it is finals time! I will definitely be taking this advice and consuming the appropriate amounts of caffeine. The topic of your post is something that is relevant to almost everyone which makes it very appealing to read. Overall, you answered almost every question about caffeine that a person could want to know. What I enjoyed most about your post is how smoothly it flowed and how you did not spend too much time on any one topic. Furthermore, although this is a post about an organic chemistry topic, the wording and explanations you used make your post easy for anyone to read. Being a coffee addict myself, this post was very useful to me. And i must say, I definitely have felt the effects of coffee, mostly during my finals week. And I never knew that coffee over longer time periods is more productive. Truly Interesting! And it was very reassuring to me personally, that coffee does have its benefits! I felt like you answered everything you were planning on.